• Ah, okay. Actually have to call. So I called the number on the screen. 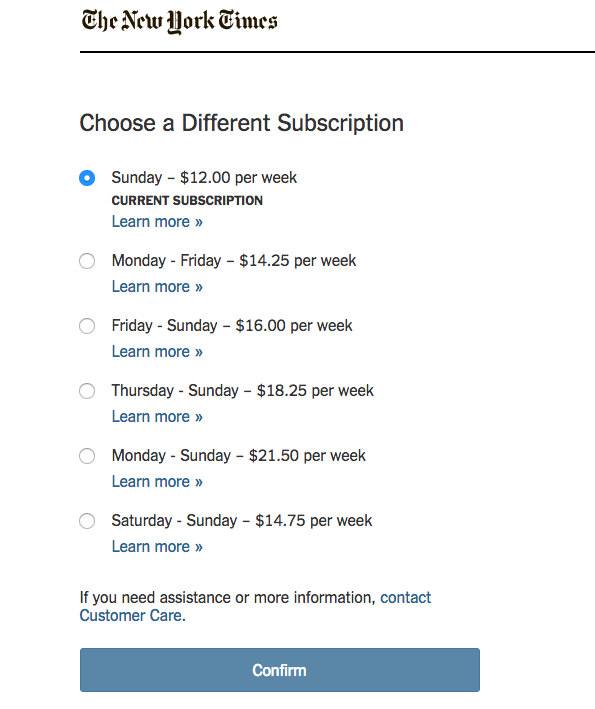 A recorded voice said that if I was already a subscriber, I had to hang up and call 1-800-NYTIMES. • I hung up and called 1-800-NYTIMES. • A robot voice asked me if my current subscription was home-delivery or digital. Mine is both. That wasn't an option. So I guessed home-delivery. • The recorded voice said it didn't recognize my phone number. I could either enter another number or enter my NYTimes account number. • I quickly went back to my browser, found my account number, and punched it in. • After a long pause, the robot voice said, "I'm sorry. Please enter your nine-digit account number, including any leading zeros." • Ooops. I carefully entered my account number again, but then realized that my account number is eight digits long and starts with a 3. • "I'm sorry. Please enter your nine-digit account number, including any leading zeros." • At a loss, I just sat there waiting for what to do next. The robot then sent me to a real human. • A nice human got on the line and asked if I was a home-delivery or digital subscriber. I said "both" and explained that I wanted to go digital-only. • She thanked me for getting both the Saturday and Sunday paper (I only get the Sunday paper), and said she had to transfer me to the home-delivery department. • A new nice human got on the line, said she understood I wanted to switch to digital-only, and said first she had to ask if I had "any favorite sections" of the printed newspaper. A little confused, I said not really, I just want to go all-digital. • Then, acknowledging that I probably didn't want what she was about to offer, she asked if would I be willing to stay on the Sunday-paper plan at a lower price. No thanks. • She then explained that there were two digital options, one at $25/month that included cooking and crosswords, the other at $15/month which is everything but those. I took the more basic version. • Because I wanted to use a new credit card, I had to read that to her over the phone. It didn't work. • I then had to read it to her again, and she realized she had mistyped the card's 3-digit security code. • Another minute or two and I was all set. At the end, I asked the agent why I couldn't do all of this online. "That," she said, "they are working on." Let's hope so. Seems all of this could have been done with a couple of clicks.